Thiocyanate complex formation, 1 of 3. 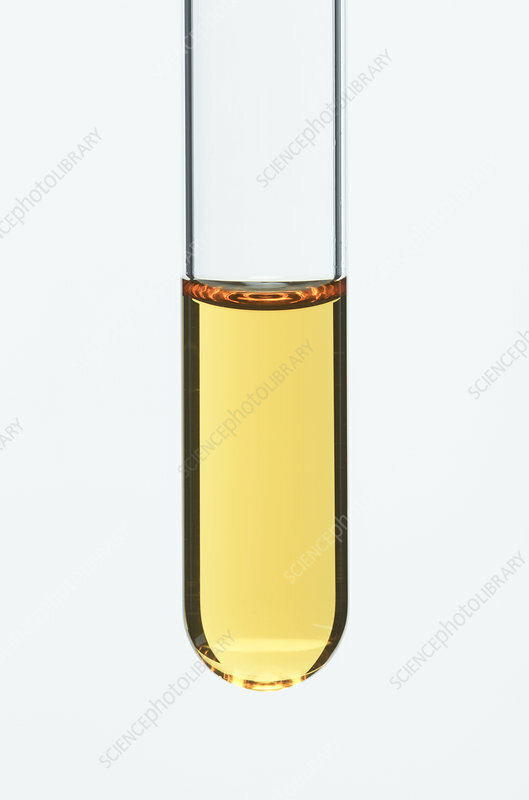 M solution of potassium thiocyanate (KSCN) is added drop by drop to a test tube with 0.25 M solution of iron(III) chloride. Iron chloride solution has a yellow colour due to formation of hexaaquairon(III) complex ion ((Fe(H2O)6)3+). When potassium thiocyanate (KSCN) is added, iron(III) ion (Fe3+) complexes with thiocyanate ion ((SCN)-), producing thiocyanatoiron(III) complex ion ((Fe(SCN))2+) that gives the solution its blood red colour. This reaction can be used as a test for Fe3+ ions in a solution.